It's your time to shine by sharing wedding dress stories, right here!!! Tell us the journey you took to pick your perfect wedding dress. Relate tips that helped you choose, find, buy and alter your bridal gown. Why not share a picture of the gown you choose for your perfect dress. Maybe you are just starting to look for your gown and need assistance. Then you are at the right place to ask a question! I and other brides will be glad to answer your questions. Below are opportunities for you to share your stories, experiences, tips and questions. Need wedding dress advice? Then ask your questions here. 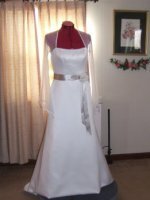 Share Your Comments About Ordering Wedding Dresses Direct From China. Share a review or testimonial about this website Perfect Wedding Dress Finder.